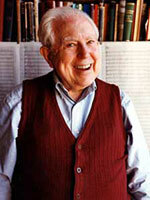 The seventh offering in Bridge Records’ series dedicated to the work of Elliott Carter is a wonderful array of the venerable composer’s recent compositions. Spanning the years 2000-2003, the composer asked that the track order commence with the freshest: Dialogues. Happily, the producers obliged and, in fact, the whole CD plays backwards in chronological time. As it turns out, that decision was a good one because the only live recording, Asko Concerto, is the weakest of the collection. This study in contrasts (instrumental, rhythmic, dynamic) comes across more intellectual than emotional. Despite having the same conductor, Oliver Knussen, the ensemble can’t match the BBC and London Sinfonietta musicians’ agility and skill. Barre Bouman’s clarinet is nimble enough, but his somewhat fluffy attacks contribute to the slight lack of ensemble tightness demanded by the score. Similarly, the extended “chat” between violin and trumpet is good but not great. Nonetheless, the sheer volume of sound produced often belies their numbers, giving the performance much punch when required. Fred Sherry is the convincing soloist in Cello Concerto. From the beautifully understated opening, which cuts through the orchestral bombast of the accompanying soundscape, his technical surety and near-perfect double stops thoroughly engage the ear as Carter captivates the mind. Unforgettable is the central “Lento” where Sherry’s plaintive wail survives then surpasses the chattering winds and purposely disjointed intensity that builds marvellously. In the truly “Allegro fantastico,” the soloist ably pucks and scampers over the strings while his colleagues flutter about in awe. Once the tympani sounds last call, and the band replies in full-cry tumult, the cello delivers one final cadential interjection before the music dissipates into a single tone. Calmer approach; woodwinds lead, who will follow? Dialogues is remarkable both for the high level of performance and the beautifully captured sound. Nicolas Hodges tosses off the considerable technical challenges with ease. Memorable is the series of decaying piano chords, followed by mainly string-answering crescendos: the balance is perfect as it celebrates the reality of sound production in disparate instruments.